Cornetist Taylor Ho Bynum has garnered a considerable amount of acclaim since his stunning debut as an ensemble leader on Other Stories (Three Suites) (482 Music, 2005). Widely considered composer Anthony Braxton's most promising former student, Bynum continues to work with his former mentor, acting as one of his key collaborators, while maintaining a distinct identity as a singular composer. Although Bynum shares some of Braxton's esoteric qualities (the modular structure of the "whYeXpliCitieS" suite, for example), he embraces a more post-modern aesthetic, maintaining an appreciation for the specifics of style as he fuses disparate genres together like patchwork collages. These concepts are fully manifest on Asphalt Flowers Forking Paths, the brilliant follow up to his sextet's debut, The Middle Picture (Firehouse 12, 2007). A collaborative composer, Bynum invokes his idol Duke Ellington when writing for his longstanding sextet, which consists of multi-reedist Matt Bauder, guitarist Mary Halvorson and violist Jessica Pavone (all fellow Braxton alumni), as well as drummer Tomas Fujiwara and guitarist Evan O'Reilly. Like Ellington, Bynum writes specific passages highlighting his accomplice's strengths, rather than academic notation intended for multiple interpretationsanother characteristic that distinguishes him from his former teacher. A magnanimous but mercurial leader, Bynum's self-acknowledged "trickster sensibility" marshals the spirit of another American icon, composer Charles Ives. This is evident on the puckish solo cornet improvisations "Open" and "Close," which offer brief experimental excursions into pure sound, full of chattering dissonances and guttural elucidations. 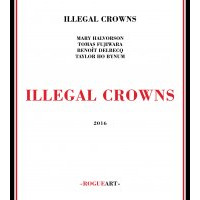 The album is structured in mirrored layers; the outer edges are book-ended by the aforementioned solo cornet improvisations, followed by terse trio excursions with Mary Halvorson and Tomas Fujiwara, which in turn frame the massive three-part "whYeXpliCitieS" suite at the album's center. The trio cuts, "Look Below" and Goffstown," offer an enthralling inversion of small combo dynamics. 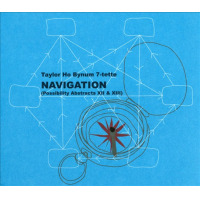 The former focuses on Halvorson and Bynum's vociferous, angular variations, while the latter finds them in a melancholy mood, allowing Fujiwara's roiling trap set to take center stage. The expansive three-part "whYeXpliCitieS" suite, dedicated to Braxton, encompasses a range of stylistic detours: screeds of distorted electric guitar feedback, folksy melodies culled from Celtic and calypso traditions, knotty counterpoint and opulent unison harmonies all weave their way through the half-hour work. Bynum breaks the sextet into various-sized sub-ensembles throughout, varying tonal and textural dynamics with great frequency. 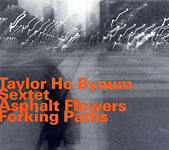 Highlights are numerous, including Pavone's dulcet viola duet with Bauder's plangent bass clarinet in the first section, Bauder and Fujiwara's frenetic duet in the second section, and Bynum's mellifluous neoclassical interlude which bridges the bittersweet calypso-themed portion of the third section with the rousing finale. Asphalt Flowers Forking Paths is another winning entry in a burgeoning discography from a remarkable writer, improviser and bandleader who has come into his own. Track Listing: Open; Look Below; whYeXpliCitieS Parts 1-3; Goffstown; Close. 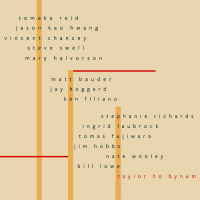 Personnel: Taylor Ho Bynum: cornet; Matt Bauder: tenor saxophone, bass clarinet; Jessica Pavone: viola; Mary Halvorson: guitar; Evan O'Reilly: guitar; Tomas Fujiwara: drums.